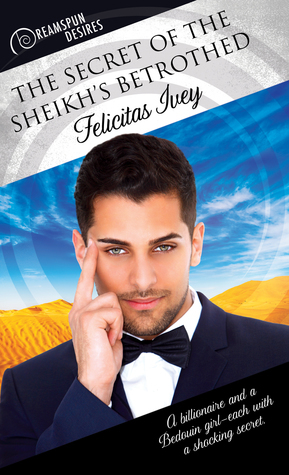 The Secret of the Sheikh’s Betrothed by Felicitas Ivey is the forty-sixth book in the Dreamspun Desires Series. This is my first book by Felicitas Ivey, and I have to say that I very much enjoyed reading it. I also can’t wait to read more books by Felicitas Ivey. This book had secrets, action, drama, verbal and physical abuse from an older sibling that forced her sibling to dress and act like a woman so that there wouldn’t be a male heir to take over the Bedouin tribe. I adored the whole story, and I was intrigued until the end. I just couldn’t put it down. Which for me is surprising because I have found from reading other Dreamspun Desire books that they are a little on the tame side for me. A little too sweet and not enough passion to balance it out. But I didn’t have that problem with this book. I absolutely loved both Fathi and Ikraam. I loved when they first met and how confused Fathi was to find that he desired a female for the first time or so he thought. It really had him questioning his sexuality since he was gay and had never been attracted to a girl before. Ikraam played the perfect Bedouin girl, and he had been forced to play the role for his whole life, so he was actually more comfortable being completely covered as a proper Bedouin then not being covered when with his betrothed even after Fathi found out that Ikraam was a male instead of a female. Which works out perfectly for Fathi since he needs to get married to a female in appearance but wants a male in his bed. This also works for Ikraam who never thought to find somebody that would accept him for who he is and still want to marry him. But for everything to work out perfectly Fathi’s grandfather will have to outwit and outplay Ikraam’s abusive and manipulative older sister and rescue Ikraam’s underage cousin from an abusive male that she is betrothed to. But you just know that Grandfather is up for the challenge. 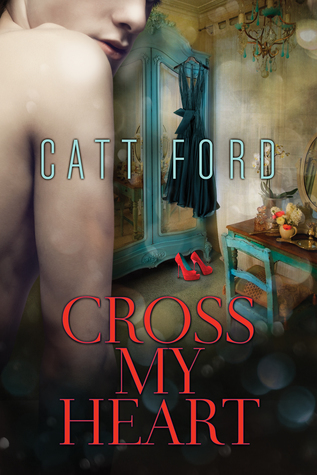 Cross My Heart by Catt Ford is a heart-warming story about two individuals trying to be true to themselves and happen to find love at the same time. The book was well written and nicely edited, and I couldn’t stop reading it. The characters were complex and damaged but still very much lovable, and they had wonderful supporting characters. The storyline was a new one for me, and I thoroughly enjoyed it. This book has so many twists and turns and trust issues and walls to break down, and I loved how the author uncovered and got us through them. And so many hot, hot, hot scenes. Yummy. I can’t wait to read more books by Catt Ford. Roland Reynolds – or Lana Renault, as she is now known – has always been a feminine boy and has always wanted to wear girls’ clothes since she was five years old. She loves the colors, textures, accessories and makeup that goes with being a female. However, she doesn’t hate her real body or being a boy. She isn’t transgender she’s a gay cross-dresser. She doesn’t think that she will ever find true love or anybody that wants to date a gay man that’s more comfortable dressed as a woman. She’s known lots of hardships in her life and has built up some very high walls. She also has three childhood friends that she affectionately calls her dwarfs and three musketeers. Her dwarves are there to protect their princess, and they are very protective especially after she’d been attacked in the past by one of her dates. Daniel has been many things in his life and not all of them good. He’s moved to France to get away from his past. He is currently a painter, and he also has some pretty high walls. When he sees Lana across a busy street, it’s love at first sight for him, and he must find out who she is because he desperately wants to paint her. He becomes kind of a stalker trying to find her until he realizes exactly how creepy he’s become and backs off. When they finally meet, they’ll tread carefully, but the chemistry between them won’t be denied. All they have to do is learn how to trust and break down some walls.